We were blessed with an abundance of pumpkins in the garden this year. With the arrival of fall, we’ve enjoyed doing a variety of activities with real pumpkins — perfect for lots of hands-on learning. So far we’ve had fun making colorful crayon-drip pumpkins and even turned one into a pumpkin volcano. 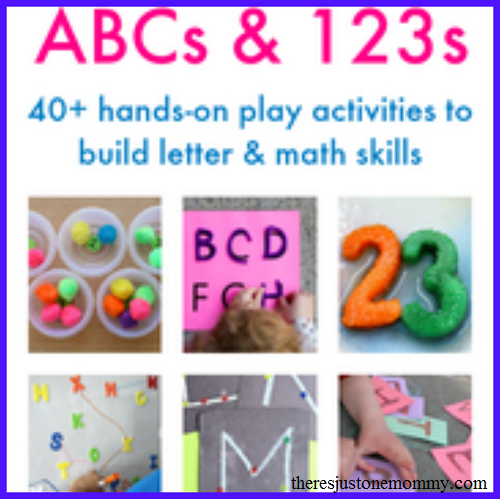 This week we got out hammers and nails for a fun fall fine motor activity. 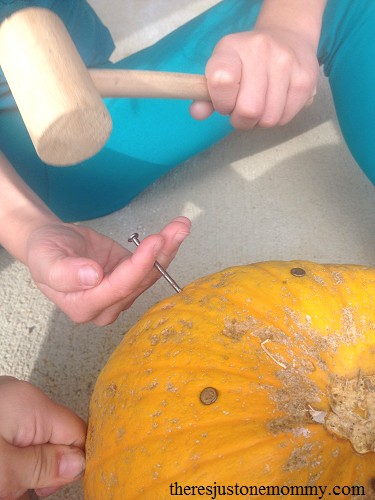 We had lots of fun hammering nails in pumpkins! Affiliate links have been used below. Click here for my full disclosure. We have had fun with hammering nails into Styrofoam in the past. With so many pumpkins on our porch, I thought it would be a fun to decorate our pumpkins in a new way. 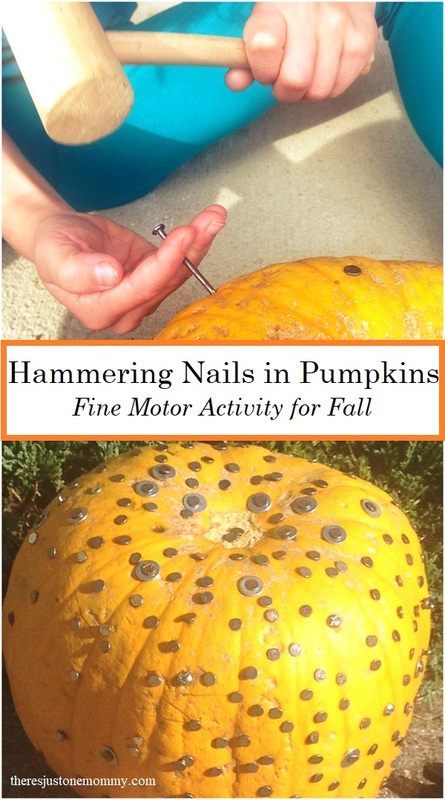 Hammering nails is a great activity for hand-eye coordination, and it provides proprioceptive sensory input, too! 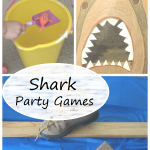 This activity doesn’t require much prep, and the list of materials needed is pretty short. You just need pumpkins, nails, and hammers. 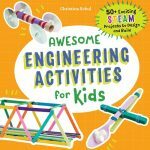 If you do the activity inside, you may want a plastic table cloth to contain the mess. My kids were super excited when they saw the container of nails shining in the sunlight, sitting next to the bright orange pumpkins and wood mallet. I bet your kids will be excited, too! They had fun hammering until every nail was used, and when they finished we had a pretty funky-looking pumpkin to display. It helps to have a hammer for each child. Who wants to wait to have a turn with the hammer? Toy hammers will work if you don’t want them to use the real one. Don’t have a bunch of pumpkins on hand? Let the kids paint them now, and then once the holiday is past, bring out the hammers and nails and let them go to town! Plan on carving the pumpkins? 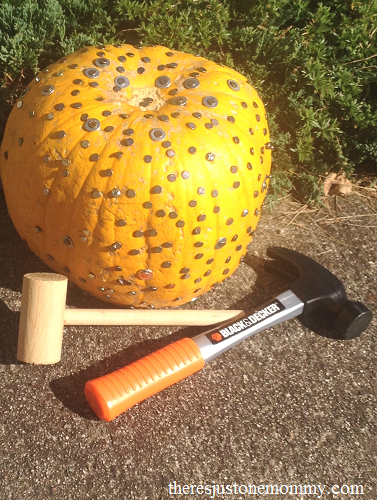 You can always do a bit of hammering once the pumpkins start to get a bit moldy. 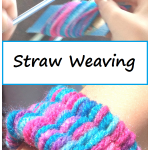 Want to turn it into an even more educational activity? 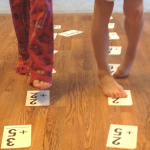 Check out how we turned it into a math activity! I admit, I’d like to hammer a few nails in one of the pumpkins, too. It looks like you guys have so much fun with pumpkins! My daughter would love this one. Last year I let her smash her pumpkin with a hammer after Halloween and she’s already asking for a repeat this year! Thanks for sharing at the Thoughtful Spot! Oh — I bet mine would love to smash a few pumpkins this year! That would definitely be a hit with my gang! If we happen upon a good pumpkin deal, we will have to give it a try. Oh, definitely do! It was a blast! We shared one pumpkin between them and it worked out fine; no need for a separate pumpkin for each. What a fantastic idea! I love this! We have just been to the pumpkin patch so have a great supply of pumpkins right now! The girls would LOVE doing this!! Thankyou so much for sharing this with me at #busydoinglife it’s great to have you linking up! It was one of their favorite things we’ve done this fall so far. Definitely a winner!